If you are hosting an outdoors or wellness event, Syzygus Movement Co can tailor to your needs. We specialize in outdoor yoga classes, providing yoga mats, yoga blocks, large mats, yoga straps, music and speakers, and instructors. Syzygus Movement Co is partnering with Katherine Holmes of Lucky Jupiter Yoga to offer a special workshop! Join us October 8th for a journey through the chakras. This workshop will include education about chakras, and yoga flow to activate and soothe the chakras, using essential oils to dive deeper into our personal energies. Learn more about the spirituality of yoga, discover yourself, and empower yourself onto a path of healing using essential oils and yoga. Participants will blend their own essential oil mixture to take home! Smoothies, nutrition advice, and a beginner yoga class, for free! 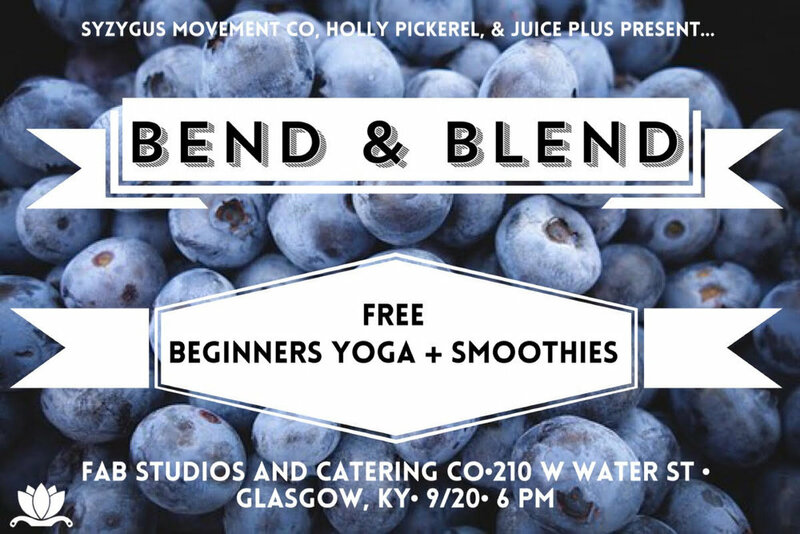 Bend and Blend is an event for the Barren River Lake area to learn about nutrition,try smoothies, and try a 30 minute beginner yoga class! Syzygus Movement Co is partnering with Holly Pickerel, a Glasgow, KY based health and wellness advocate, to offer this event! Syzygus Movement Co partnered with essential oils specialist Shelley Owens to host a yoga and essential oils workshop. During this two hour class, participants enjoyed breakfast, created three oil blends, and practiced a 45 minute yoga class, taught by Syzygus instructor Lauren English.